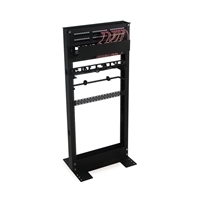 The Kendall Howard 24U 2-Post Eco Rack is the perfect racking solution for wiring closets, telecom rooms, and data centers. The 800 lb. weight capacity will support all of your telephony and network equipment such as patch panels, switches, routers, and more. The unique design features both cage nut style and 10-32 tapped rails, and with six possible anchor points to ensure stability, the Kendall Howard 24U 2-Post Eco Rack is perfect for any environment. Kendall Howard 1911-3-200-24 is a replacement for Kendall Howard 25U 2-Post Eco Rack part 1911-3-100-25. 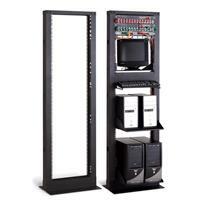 The Kendall Howard 45U 2-Post Eco Rack is perfect for wiring closets, telecom rooms, and data centers. 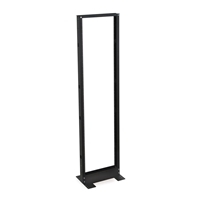 This 19″ EIA compliant rack is sturdy and has an 800 lb. weight capacity. The unique design offers both tapped 10-32 rails and universal cage nut rails. The self-squaring design makes assembly a snap, and with six possible anchor points to ensure stability the Kendall Howard 45U 2-Post Rack is perfect for any environment. Kendall Howard 1911-3-200-45 is a direct replacement for part 1911-3-100-45. The Kendall Howard 2-Post Cable Cove Rack is the perfect relay rack for high density network and telecom installations! The 1,200 lb. weight capacity and 4″ vertical cable channels can handle just about any network large or small. So load it up with servers, UPS’s, rack shelves, patch panels, switches, and more. The Kendall Howard Cable Cove Rack is ready for the challenge! The Kendall Howard 2-Piece Conversion Kit is one of the handiest bracing systems on the market today. Not only do conversion kits anchor a 2-post rack to the wall, but they also limit the risk of the rack tipping over. If you have to move or replace the rack, the conversion kit will help keep repair costs low because patching holes typically costs significantly less than removing anchors. 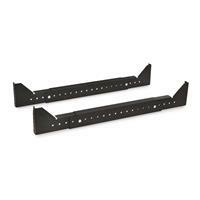 Whether anchoring two racks together or bracing them to the wall, the 2-Piece Conversion Kit provides a safe and dependable solution. The Kendall Howard 4-Piece Conversion Kit is one of the handiest bracing systems on the market today. 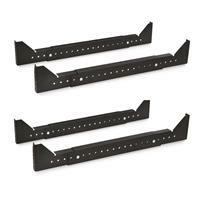 Not only do conversion kits anchor a 2-post rack to the wall, but they also limit the risk of the rack tipping over. The 4-Piece Conversion Kit allows you to also upgrade any 2-post rack to a 4-post rack with an adjustable depth of 24 – 40″. If you have to move or replace the rack, the conversion kit will help keep repair costs low because patching holes typically costs significantly less than removing anchors. Whether anchoring two racks together or bracing them to the wall, the 4-Piece Conversion Kit provides a safe and dependable solution.